1. Fry the red peppers in the oil until soft. Next add the prawns and, when they turn pink, add the jalfrezi sauce to the pan and stir in the tomato purée and 100ml water. Once piping hot, remove from the heat. 2. Meanwhile, discard the cauliflower leaves and coarsely grate the cauliflower on a box grater to give about 700-800g. Steam the cauliflower for 2-3 minutes until just tender, either in a steam basket over boiling water, or in the microwave. Then toss in the melted butter or ghee with the crushed cardamom and toasted desiccated coconut. 3. 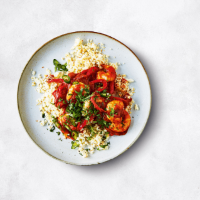 Serve the curry and cauliflower rice together with the chopped coriander and green chilli to garnish. Cook’s tip Use up any leftovers by reheating thoroughly, then adding hot vegetable or chicken stock to make a hearty soup.